Diesel Dispensing Tanks (Fuel Points) are safe, secure and designed with environmental safety in mind. Rotationally Moulded in the United Kingdom from a high grade Polymer – MDPE, Medium Density Polyethylene which is tough, durable and UV Stabilised to prevent colour fade. For added security it is supplied complete with a secure tank lock fixed to the outer lid. The tank comes supplied fully fitted out and ready to use. 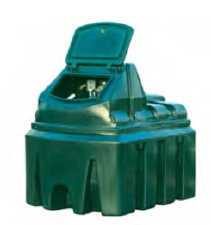 Our Bunded Diesel Dispensing Tanks come with a 10 year warranty.